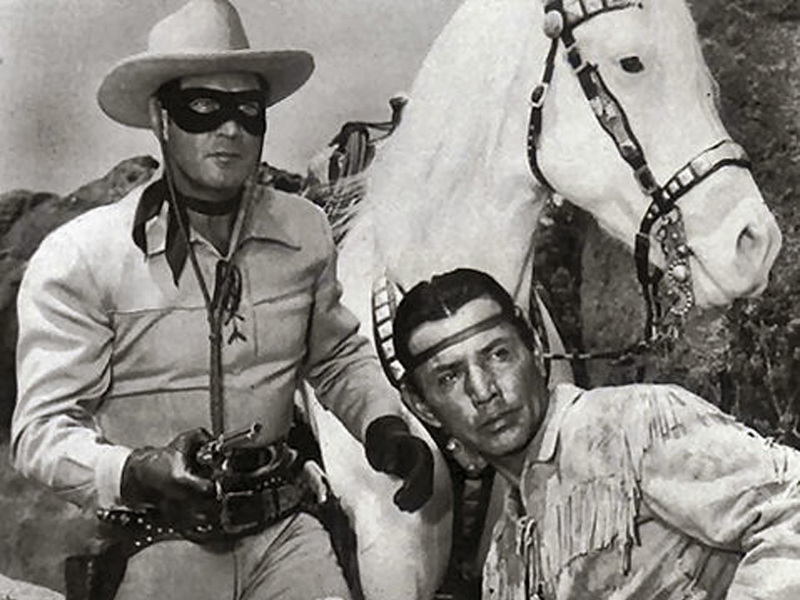 National Building Museum Fellowship Update #3: The Lone Ranger,Design Educator + Instigator? One portion of the National Building Museum’s impressive building toy collection that I have been particularly interested in during my Field Fellowship at the Museum, are the instruction manuals. How do toy manufacturers describe design and what do they do to help others build great things? How can we learn from this to teach better or to create more engaging and innovative public design processes- to grow what I like to call, ‘cultures of greatness’? The instructions for Dr. Richter’s building toys, Anchor Stones, are one of my favorites and a rare example of a building toy manufacturer using storytelling and supportive drawings to create a compelling, immersive experience that is akin to a video game. In his stories, the eponymous Dr. Richter creates a scene or play frame (see Gregory Bateson’s work) that describes not only what it feels like to build and explore with Anchor Stones but also how adults and other family members can meaningfully contribute to the building process. Indeed, he even tells the story of the skeptical mother, who thinks that toys and play are beneath her, not only getting sucked into the children’s design process but actually then wanting to build her own creations; something I see time and time again in my own work. Richter details the experience of innovation, adversity, collaboration and joy, smartly countering such things as parental hesitation and creative inhibitions. 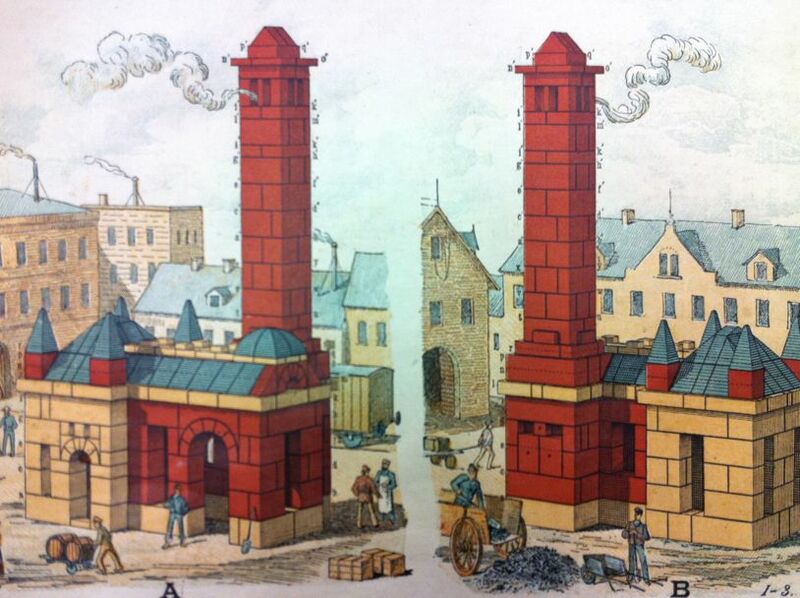 The story is supplemented with almost fairytale drawings and illustrations that show how people are using and inhabiting the buildings that the user will ultimately construct. Cheerios’ Lone Ranger Frontier Town takes storytelling as a design, instruction and behavior modeling tool one step further. 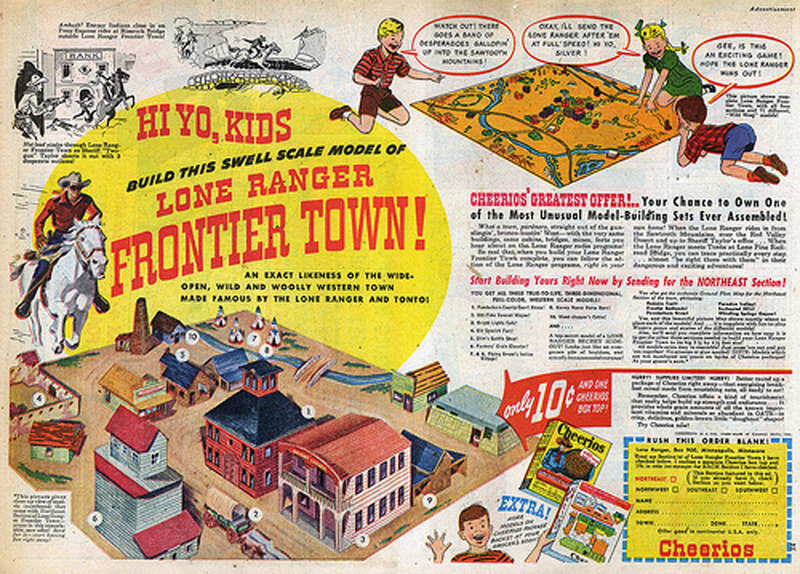 In 1948 Cheerios started offering various pieces of the Lone Ranger Frontier Town in its cereal boxes. By purchasing nine different boxes of Cheerios, a boy could acquire the four maps comprising the town’s plan, construct all of the cardboard buildings and a train so that he could recreate in three dimensions and real time, the Lone Ranger’s weekly exploits on the radio! While the town itself was not intended to be redesigned, the toy is remarkable in the way that it allowed a child to explore a place, its people and how they could use the town’s various structures, and spaces. The impact of having physical objects and a spatial context in which to explore a storyline had a powerful impact on its users. Yesterday, a visitor at the National Building Museum vividly recounted playing with the toy over sixty three years ago as if it had just happened earlier in the day. Undoubtedly, play continued well after the weekly broadcasts, with children across the country expounding on that week’s storyline, exploring different community member’s roles while creating their own uses for the various streets, buildings and infrastructure of the town. And surely, kids moved the buildings and various other pieces of the town around to meet the needs of their new stories, playmates and the inclusion of unrelated toys. It is incredible to think, for a moment, about the tremendous amount of city planning and ‘community research’ that was occurring simultaneously throughout the country after each of the radio shows. The Lone Ranger Frontier Town and Dr. Richter’s instructions for his Anchor Stones are so compelling because they offer engaging approaches to describing and encouraging the exploration of design, and a place that are completely different from the norm. Their interweaving of story, space and physical object presented incredibly captivating platforms upon which creativity, collaboration and insight could occur. And in the midst of hoopla surrounding the immersive experience that such things as iPad’s and video games can create, Dr. Richter’s Anchor Stones and the Lone Ranger Frontier Town are important reminders that we don’t always need the most cutting edge technology to create the immersive experiences that are so utterly lacking in our class rooms, planning meetings and design processes. Indeed, I have repeatedly found in my own work that storytelling, behavior modeling, a little bit of fantasy, a healthy dose of playful cajoling and engaging, hands-on tools can go a long way towards helping great things happen. Alex Gilliam, the Director of Public Workshop, is currently the Field Fellow at the National Building Museum in Washington, D.C. and is conducting research in its extensive Architectural Toy Collection. The opinions expressed in this article are his own. All included images are courtesy of the National Building Museum. To use or obtain copies of these images, or if you have any other questions about the collection, please contact: research@nbm.org . The Lone Ranger Frontier Town image is used with permission by Dan Goodsell. You can find him and other interesting images on Flickr under grickily. Great article! Does anybody know a way that I might be able to finish reading Uncle Jack’s Present or where I might find this story digitized? A Google Book search found a copy but had no preview available. Thanks for you comment, I am so pleased that you like it. As far as I know, you will have a really hard time finding copies of Uncle Jack’s Present as it was part of the instruction manual included in various Anchor Stone sets, not something Richter distributed independently. Send me an email and I will speak with Museum staff about whether I can post the full collection of images of the story. Anchor Stones are still being produced and the Museum does have some concerns about copyright, etc.. Thanks for your response to my comment and for offering some help. I just loved reading the excerpt from the book. 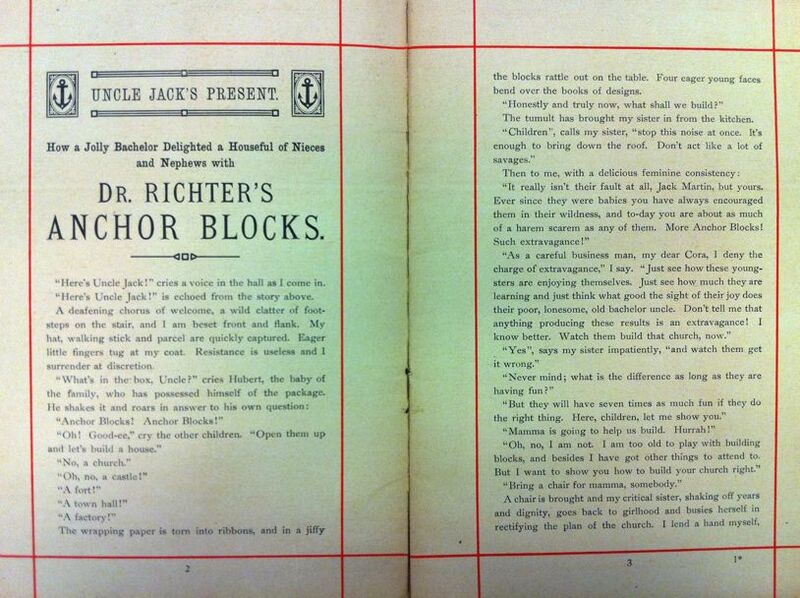 I am a avid collector of both original and modern sets of Richter’s Anchor Stone Blocks (Anker Steinbaukasten) and have a lot of the material that accompanied these sets but this is the first time that I have seen a story about Uncle Jack’s Present. Anyways, because of the fact that I am always trying to get my nephews into building with this great toy I am now just hoping to finish reading the story, maybe to them, and maybe someday I will come across the book at an auction or something. Also. I did a search on the Club of Anchor Friends archive site http://cva.flying-cat.de/ which has scans of material from the building templates and other related items when such an item is found. I’m sure that a scan of this book would be most appreciated for their archive as well. Thanks for sharing the link and it’s great to hear about your collection. They are definitely one of my favorite toys here. Their weight or heft and the surprising complexity of their sets makes them incredibly pleasing. I will be in touch later this week with some options regarding Uncle Jack’s present. And good luck with your nephews. There are few things I enjoy more than building with mine.